A few events coming up in the next few months. Watch this space to hear news of future exhibitions. NEXT UP is MADE in CLERKENWELL, London – 24th to 27th May 2012. Please stop by and say hello. Click the image to enlarge. 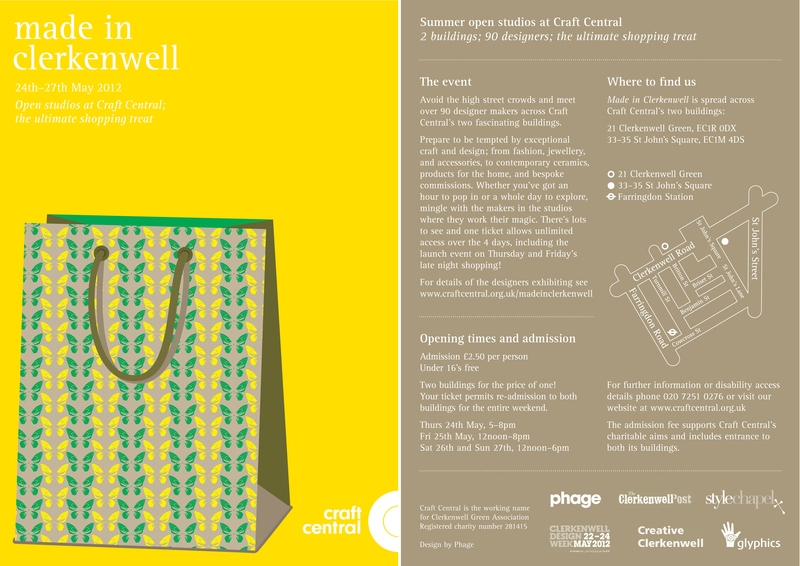 Venue: CRAFT CENTRAL HAS TWO GREAT BUILDINGS! 2 buildings; 90 designers; the ultimate shopping treat! whether you’ve got an hour to pop in or a whole day to mooch, mingle with the makers in the studios where they work their magic. One ticket allows unlimited access over 4 days, including Thursday’s launch event and Friday’s late night shopping. by meeting the maker. Stand out from the crowds and commission your own piece or discover a bespoke design service.